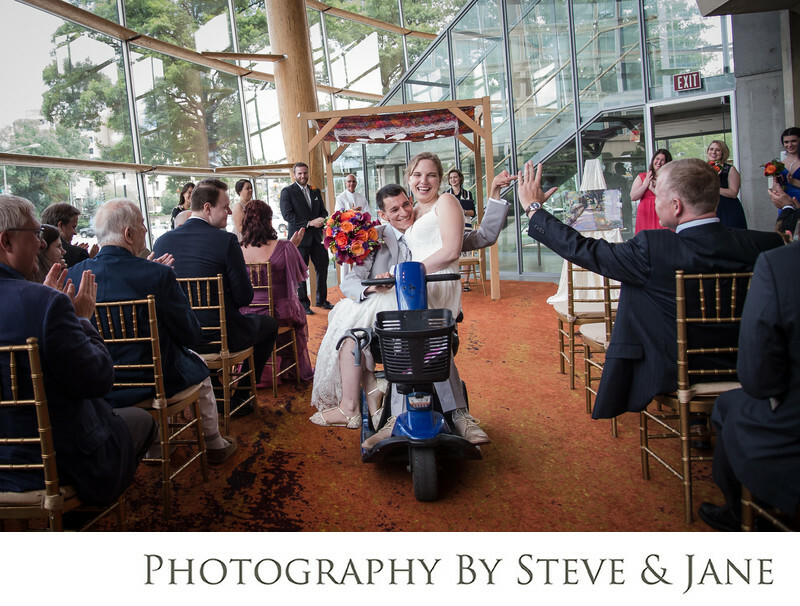 This Jewish Protestant interfaith wedding at Arena Stage was full of tears of joy and so much laughter. This couple chose to get married under a custom made hoopah that matched the colors in the lobby just outside of the Molly Smith Study. The floor to ceiling windows gave the feel of being outside, but without the summer heat. Champagne was passed around as guests arrived to witness the nuptuals. The intimate ceremony included a hoopah signing and blessings from Rabbi Deborah Reichmann from DC and Pastor Joe Hamby from the Bride's hometown of Charlotte, North Carolina. After both officiants gave heartfelt and beautiful speeches, the couple signed a custom designed kettubah and exchanged wedding rings. The best part of the ceremony was the couple's recessional. Their smiles say it all as they are finally husband and wife. Their guests clapped and cheered for this sweet couple. After the nuptials were over, their friends and family enjoyed cocktail hour and one of a kind views of DC on the rooftop terrace. The clean lines and large glass windows offer a quiet sophistication high about the busy neighborhood located in southwest. The terrace offers sweeping views of the Washington Monument and the newly revitalized Wharf. Out of town guests and your DC friends will love this view not found anywhere else in the city. A buffet style dinner was catered by Design Cuisine in the Molly Smith Study. This couple chose to give their guests the choice of a pasta station, a paella station, and even a gelato and dessert bar. Bruce Pike Productions provided the music for the evening and kept the dance floor going. Pike Productions is one of the best event and entertainment companies in the District. At the end of the night, the couple went outside for a quiet exit with just the two of them on the groom's scooter as they made their way to their apartment just a few blocks away. Location: 1101 6th St SW, Washington, DC 20024.